Well, can you believe the end of the year has arrived? I wasn't really planning it this way but this wrap sweater just happens to be my last garment creation of 2014. I had some vague notions of making a pretty dress (I have both the Darling Ranges pattern and the Alder Shirtdress waiting in the wings) or some fabulous New Years party frock but alas I've run out of time and this sweater is the one that ends the year. 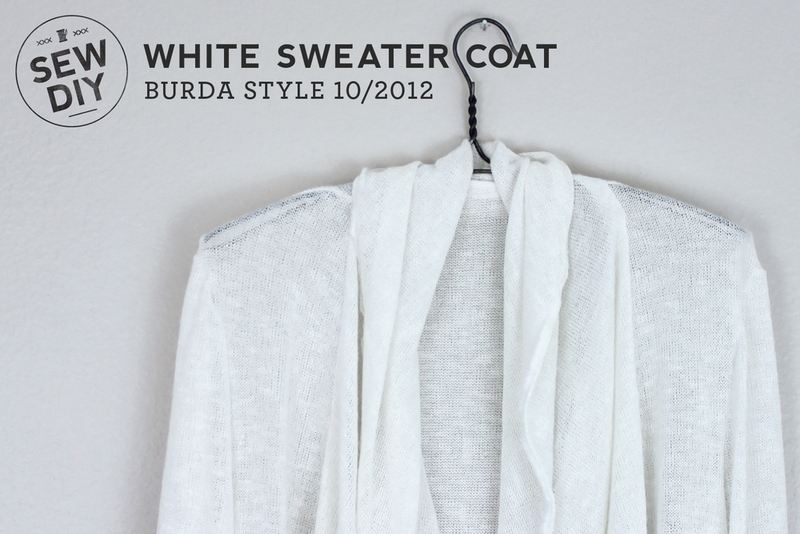 The pattern for this sweater coat is from the 10/2012 issue of BurdaStyle magazine (pattern online here). I rarely buy BurdaStyle magazine but there were a couple of patterns that I really liked, including this one, so I picked it up. I've only sewn from the magazine a couple of times and I had forgotten how frustrating it was to trace the pattern. I would much, much rather print a pdf and tape it together than try to find those lines. I've had this pattern in mind for a long time, looking for the right fabric. It requires about 4 yards of fabric so I wanted to find something cheap (cause that's just how my mind works). So, when I saw a big roll of this winter white sweater knit at the bulk store downtown, I bought a bunch of it. The fabric was really pretty easy to handle. I serged most of the seams except for the dart that runs along the shoulder line and the topstitching around the collar and hem. I made a few modifications to the pattern. I shortened it by about 6-7 inches and omitted the pockets, belt and belt loops. In retrospect it wasn't that hard to put together but it was really hard to figure out the dart and I would have appreciated some illustrations on how to sew that darn thing. I feel pretty ambivalent about this sweater. The shoulders don't fit as well as they could and the topstitching is a little wonky. I actually like the photos of it more than I did when I just tried it on. Here I'm wearing it with an old J.Crew tank and my standard uniform of BDG jeans and booties. Now, it's time to start planning my 2015 wardrobe! I have a few things leftover from my 2014 list and I'm sure I'll be making a few versions of the aforementioned dresses. Do you have plans for 2015 sewing?